In the Signals Museum at RAF Henlow on the morning of 28th June 2012, the nostalgic sound of a live transmission from a World War II T1154 equipment was heard through radio static. The signal was being picked up by another piece of wartime equipment, an American AR88 receiver that had been restored to working order in the Signals Museum. (The T1154 transmitter was used in Lancasters and other heavy bombers in the conflict; the AR88 was a ground receiver). 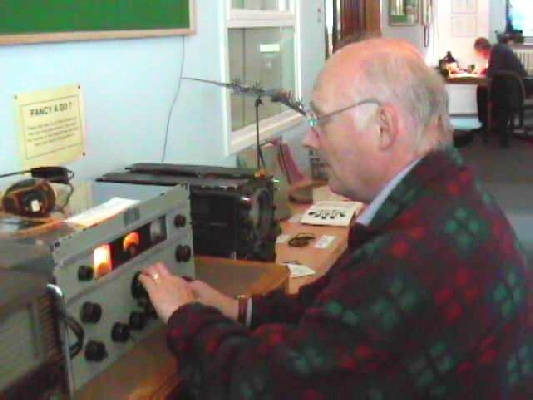 The radio activity, taking place on the day of the opening of the Bomber Command Memorial in London, had sprung from a request from a Radio Amateur, Andrew (callsign GW3OQK) of Gorseinon in Wales, for other amateurs to listen out for his T1154 transmissions on the day and, as far as possible, to reply using radio equipment of a similar vintage.Two days before the event,our response was put in motion by members of the Signals Museum staff. Equipment that could be used without too much disruption to the Museum consisted of the AR88 receiver and a T1509 high frequency transmitter together with its CU310 Remote Control Unit. A slight problem was that the receiver and transmitter couldn’t be brought close together – the T1509 transmitter weighs 800 pounds (364 kg), and would have to stay where it was! (The AR88, in contrast, weighs only 48 pounds (22 kg)). The ‘Team’: Kevin Staley, left; Dave Thompson, centre; Alf Fisher (with CU310), right. Set of 813 valves obtained, all good ones, we were lucky! then needed for the antenna connection to the T1509. A minor complication was that there was only one antenna. 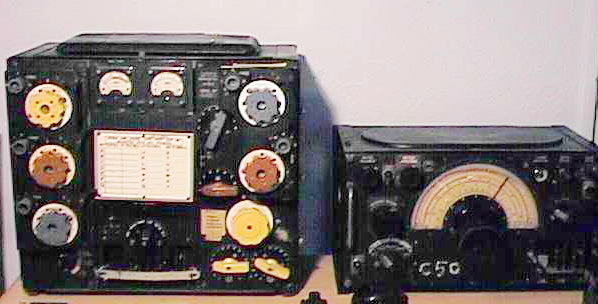 Normally a Ground Communications set-up such as this would use widely-separated antennae, one for the transmitter and one for the receiver. The problem was solved by what the Navy would describe as a ‘jury rig’, with a manual change-over switch being used for the antenna connections. To operate, Assistant Curator Dave Thompson used a ‘candlestick’ carbon microphone to speak through the transmitter, and made notes of contacts made, etc. In the meantime, he was helped by two assistants when it came to changing over from Transmit to Receive, and vice versa! Flight Sergeant Kevin Staley, OIC, operated the Mute switch on the receiver on Transmit, to stop the transmitted signal from blaring out of the loudspeaker, while Alf Fisher (Curator) operated the CU310 Transmit/Receive switch and the Antenna Changeover switch for both Transmit and Receive. The arrangement worked pretty well, all things considered. Footnote: The three valiant operators are all licenced Radio Amateurs – Kevin is G0PWR, Dave is G3OXG and Alf is G3WSD. How did we manage to legally use our vintage transmitter on the air? We have a special Amateur Radio Licence for our Museum Station, GB4SMH. Just prior to this live event, we had been participating in International Museums on the Air Weekend so we had a suitable antenna erected and all we had to do was use it with our vintage equipment. Our station is now active every Tuesday and on any Public Open Days, usually the first Saturday of the month with the exception of January. We still take part in Museums on the Air every June as well.